One day you noticed that your application pools getting stopped and when try to run again it is stopping again and after a while you suspected that the problem may be caused by identity account corruption and decided that change application pool identity or reset current identity’s password but then upps your getting fallowing error. 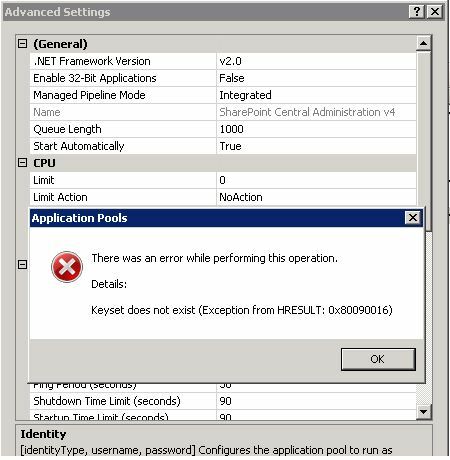 If you get this error first you have to check your MACHINE Keys.By the way i have to say the machine key not only used by IIS or your web sites. So many process can use machine keys to encrypt or decrypt secures like strings,passwords,connection strings etc. As you noticed if some how your machine keys are changed or deleted you may have a big problem if you dont have any proper backup. but how could that happens ? There is so many possibility here , Malwares,Group Policies,Permission issues, User mistakes , Cleanup programs, misconfigrurations. 1) Restore missing keys from newest good backup. You need to reinstall SharePoint or IIS even may need all machine. And after do that you must reset all your sharepoint managed accounts’s password. Machine Keys are important for security and always consider to save them.If you are suspecting that your machine keys stolen you may need to reset your all passwords not for sharepoint all accounts for that machine in use and dont forget machine keys not use only by IIS. if you think that the issue related a permission issue you may use “Process Monitor” to find out which process can not reach your data.